Workspaces are places to collaborate with colleagues to create collections of dashboards, reports, and paginated reports. The new workspace experience helps you better manage access to content. This article describes the new workspaces, and how they differ from the classic workspaces. As with classic workspaces, you still use them to create and distribute apps. Read about how to create a new workspace experience. The new workspace experience has reached general availability (GA), and is now the default workspace. You can still continue to create and use classic workspaces based on Office 365 Groups. To enforce row-level security (RLS) for Power BI Pro users browsing content in a workspace, continue to use classic workspaces. Select the Members can only view Power BI content option. Alternatively, publish an Power BI app to those users, or use sharing to distribute content. The forthcoming Viewer Role will enable this scenario in future in new workspace experience workspaces. Assign workspace roles to user groups: security groups, distribution lists, Office 365 groups, and individuals. Create a workspace in Power BI without creating an Office 365 group. Use more granular workspaces roles for more flexible permissions management in a workspace. When you create one of the new workspaces, you're not creating an underlying, associated Office 365 group. All the workspace administration is in Power BI, not in Office 365. In the new workspace experience, you can now add an Office 365 group in the workspace access list to continue managing user access to content through Office 365 groups. Administration for new workspace experience workspaces is now in Power BI, Power BI admins decide who in an organization can create workspaces. They can also manage and recover workspace. To do this they need to use the Power BI admin portal or the PowerShell CmdLets. For classic workspaces based on Office 365 Groups, administration continues to occur in Office 365 admin portal and Azure Active Directory. In Workspace settings in the admin portal, admins can use the Create workspaces (new workspace experience) setting to allow everybody or nobody in an organization to create new workspace experience workspaces. They can also limit creation to members of specific security groups. The Create workspaces (new workspace experience) setting defaults to only allow users who can create Office 365 Groups to create the new workspaces in Power BI. Be sure to set a value in the Power BI admin portal to ensure appropriate users can create new workspace experience workspaces. The workspaces list is available in the Power BI admin portal. New, upgraded workspaces, and existing classic workspaces coexist side by side, and you can create either. The new workspace experience is the default workspace type. Power BI continues to list all Office 365 Groups the user is a Member of in Power BI to avoid changing existing workflows. To learn how to create a new workspace, read Create new workspaces. To learn how to create a classic workspace, read Create the classic workspaces. To grant access to a new workspace, add user groups or individuals to one of the workspace roles: members, contributors, or admins. Everyone in a user group gets the role you’ve defined. If an individual is in several user groups, they get the highest level of permission provided by the roles they are assigned. Roles let you manage who can do what in a workspace, so teams can collaborate. New workspaces allow you to assign roles to individuals, and to user groups: security groups, Office 365 groups, and distribution lists. When you assign roles to a user group, the individuals in the group have access to content. If you nest user groups, all the contained users have permission. A user who's in several user groups with different roles gets the highest level of permission granted them. The new workspaces offer three roles: admins, members, and contributors. Everyone you add to a workspace needs a Power BI Pro license. In the workspace, these users can all collaborate on dashboards and reports that you plan to publish to a wider audience, or even to your entire organization. If you want to distribute content to others inside your organization, you can assign Power BI Pro licenses to those users or place the workspace in a Power BI Premium capacity. Publishing reports to new workspace experience has stricter enforcement existing licensing rules. Users who try to publish from Power BI Desktop or other clients tools without a Pro license see the error "Only users with Powre BI Pro licenses can publish to this workspace." How are the new workspaces different from current workspaces? With the new workspaces, we're redesigning some features. Here are the changes you can expect to be permanent. Creating these workspaces won't create Office 365 groups like classic workspaces do. However, you can now use an Office 365 group to give users access to your workspace by assigning it a role. In classic workspaces, you can add only individuals to the members and admin lists. In the new workspaces, you can add multiple AD security groups, distribution lists, or Office 365 groups to these lists to allow for easier user management. You can create an organizational content pack from a classic workspace. You can't create one from the new workspaces. You can consume an organizational content pack from a classic workspace. You can’t consume one from the new workspaces. The new Contact list feature allows you to specify which users receive notification about issues occurring in the workspace. By default, any user or group specified as a workspace admin is notified, but you can customize the list. Users or groups listed in the contact list will be shown in the user interface (UI) to help users get help related to the workspace. Read more about the setting the workspace contact list. The Workspace OneDrive feature allows you to configure an Office 365 Group whose SharePoint Document Library file storage is available to workspace users. The group needs to be created outside of Power BI. Power BI doesn't synchronize permissions of users or groups who are configured to have workspace access with the Office 365 Group membership. The best practice is to manage workspace access through the same Office 365 Group whose file storage you configure in this setting. Read about how to set and access the Workspace OneDrive. The following activities are audited by Power BI for new workspace experience workspaces. Read more about Power BI auditing. Workspaces can contain a maximum of 1,000 datasets, or 1,000 reports per dataset. A person with a Power BI Pro license can be a member of a maximum 1,000 workspaces. Power BI publisher for Excel isn't supported. Licensing enforcement: Publishing reports to new workspace experience enforces existing licensing rules that require a Power BI Pro license for users collaborating in workspaces or sharing content to others in the Power BI service. Users without a Pro license see the error "Only users with Powre BI Pro licenses can publish to this workspace." Read-only workspaces: Instead of granting users read-only access to a workspace, you'll assign users to a forthcoming Viewer role, which allows similar read-only access to the content in a workspace. No. Links to existing items in classic workspaces aren't affected by the new workspace experience. 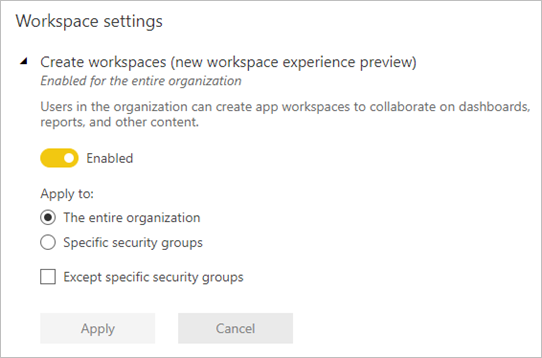 The general availability (GA) of the new workspace experience changes the default workspace you create, but doesn't change existing workspaces. No. The new workspace experience GA only changes the default workspace type to the new workspace experience. Existing classic workspaces that are based on Office 365 Groups remain unchanged.